Oh brother, what are those freaking Mets up to this time? In Monday’s game against the Giants, with two outs in the top of the 13th and runners on the corners, Mets pitcher Tyler Bashlor induced what looked to be a catchable pop fly. Not for these morons! 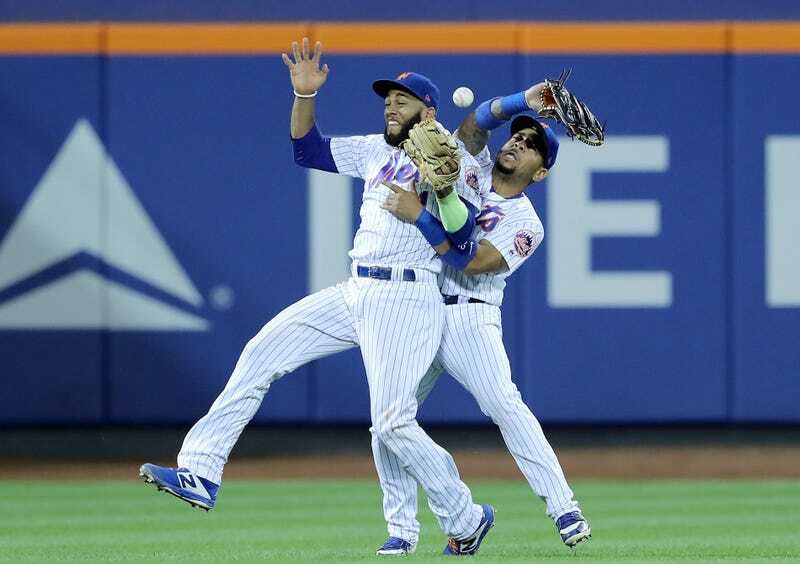 Left fielder Dominic Smith and shortstop Amed Rosario ran into each other, allowing the Giants’ Andrew McCutchen to easily score the go-ahead run. Judging from the audio, the crowd in the quarter-filled stadium was disappointed but not entirely shocked to see the idiot Mets screw up this way. The moment of pause between the drop and Rosario’s throw was excruciating but also illustrative. Ah yes, their faces said. We play for the Mets. Smith took the blame for calling for the ball too late; McCutchen found it hilarious. “Laughed all the way to the dugout,” the Giants outfielder said. Just another classic gaffe from the New York baseball team that everyone loves to watch! This team should actually be contracted at the end of the season. The Mets’ existence is immoral.